As almost 200,000 folks get ready for their annual excursion to Las Vegas for CES (Consumer Electronics Show), those of us who toil in B2B tech public relations will be looking for 2017 trends to take advantage of industry moves and stake out positions for clients. As we get ready for the new year, we’ve interviewed some tech PR specialists to get their take on what’s around the corner. CX goes hard. In a world of rabid competition, the customer experience can be all that stands between delight and the dreaded zero stars on a review site. PR and CX go hand in hand, since it’s PR’s role to burnish a brand reputation and the job can only be done when the customer experience lives up to expectations. Good CX combines people, process and technology to understand, anticipate and consistently deliver a high-quality experience across all of a product or service brand’s touch points, from website to customer service. In 2017 CX will evolve further, as B2B tech players adopt market strategies to offer a more personalized experience for customers that is rooted in a deep understanding of individual needs. The smart B2B PR team will leverage CX learning and experience to create compelling case studies and content. Everyone loves a story of customer service that goes above and beyond. PR must function in real time. The exponential growth of digital media is a positive thing when it comes to engaging influencers and customers, as well as adjusting tactics as needed during a campaign. We’ve seen how powerful real-time marketing is for consumer brands that are active on social channels. The same opportunities – and challenges – exist for B2B services and products on LinkedIn, Twitter, or other, more niched social platforms. After all, enterprise software customers are likely to be watching the Super Bowl, tuning into election or inauguration news, or following stock market trend stories. And there’s also the defensive side of real-time marketing. Potentially negative situations can and do happen at any time with a miscalculated tweet or unhappy customer post. PR monitoring and oversight of social and customer relations channels is more important than ever, as B2B companies have learned to incorporate real-time marketing into their programming, according to Econsultancy. B2B content will become more customized. Savvy content marketers have always written with specific audiences in mind. Ad tech clients want to speak to marketing decision-makers, 3D printing clients target prospective partners in medical or architectural sectors, and so on. 2017 promises to take the creation and promotion of content directed to a specific segment or prospect even further, using emerging tools and technologies like geo-location data to personalize language and pricing, or lead-driven content marketing software to customize email responses. PR and content will become more automated and scaleable. It may seem like a contradiction for content to become more personalized, while also becoming more automated, but that’s the power of technology. Any marketer knows it’s impossible to manage social media and complex targeted outreach without marketing automation software and other tools. Earned media, paid media, and owned content can be enhanced and amplified through social tools and techniques. The latest technology for scaling content marketing may be the most promising. Artificial intelligence is poised to transform content creation, its curation, and predictive customer service, among other marketing and PR functions. PR will embrace paid media. Between 2012 and 2014, organic social reach dropped from 16% to 6% –and wise PR counselors know they have to bite the “paid” bullet if they wanted to maximize social content. Paid reach is a typically part of any social strategy for B2B tech, and much like marketing embracing automation, PR will make the shift from organic digital to paid reach. The stats support this: paid advertising now accounts for 83% of marketers’ social media spending and, according to a recent study, 84% of marketers have now fully integrated social media with their traditional marketing activities. B2B content must be shareable. Paid reach has its place, but we’re still chasing “viral” or highly shareable content. As election 2016 showed, social media has arrived as a primary news source. According to the often-cited News Use Across Social Media Platforms 2016, 62 percent of Americans get news from social media, and the number will only rise with Gens X and Y veering from conventional media sources to strictly online content. 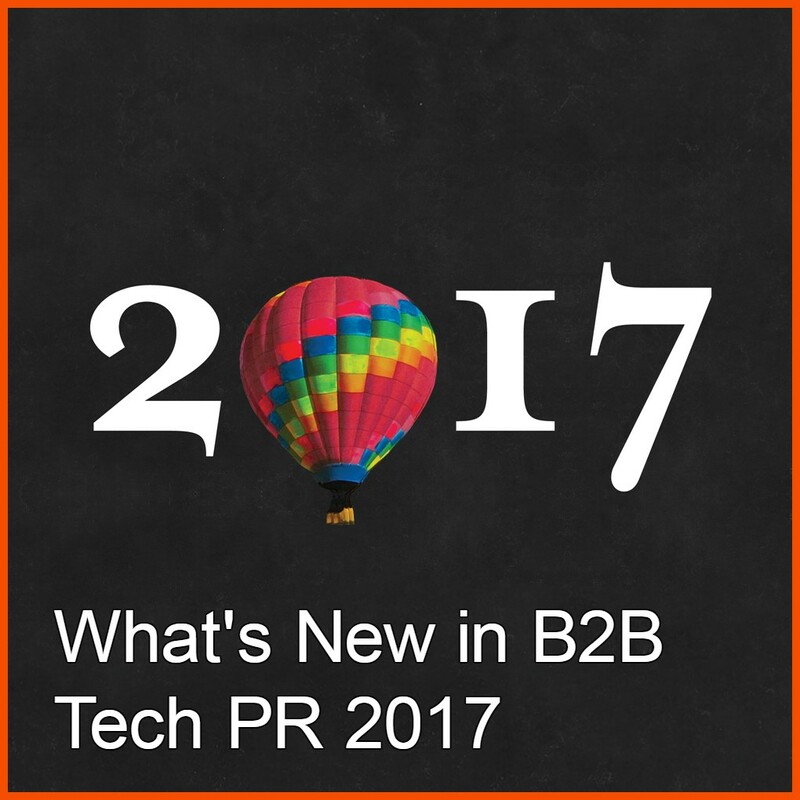 For B2B tech PR teams, the challenge is to craft the shareable story. We recommend asking these five questions when putting together a story with the goal of social sharing. What’s the headline? Do this first. Make it simple and specific, you can add drama or something startling later, but get your story’s “promise” down before you start writing. What’s your way in? Are you profiling a tech exec with an interesting background, crafting a stat-filled report or positing some predictions?. Organize before you write. How is your story different? There are a million start-up stories out there, what makes yours special? Is it a young female CEO such as gaming client Arkadium’s Jessica Rovello or is it a monumental fundraise that will drive attention? Ask and answer. Why would you share it? Put yourself in the reader’s shoes and see what they might feel when reading your story – intrigued? happy? angry? any of those are fine, as long as you achieve interaction. What’s next? Think ahead – once the story is published, compile the metrics, read the comments and let them inform your next steps.